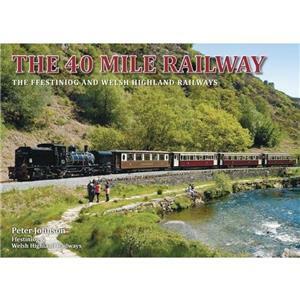 Peter Johnson’s book - The 40 Mile Railway. Restoration of the 25-mile Welsh Highland Railway from Caernarfon to Porthmadog has, combined with the Ffestiniog Railway’s historic route from Porthmadog to Blaenau Ffestiniog, created one of the great railway journeys of the world. Peter Johnson has brought together over 250 illustrations from many different sources to describe a journey from Caernarfon to Blaenau Ffestiniog that also looks over the fence at the hidden world of villages, remote farms, hamlets and relics of the past that are passed by the trains. Take a journey over the 40-mile railway, discover the secrets of its route and savour its scenic wonders in this 160-page hardback book published by the Ffestiniog & Welsh Highland Railways.